Imagine you’re disembarking from a Pan Am flight in the 1960s. You’re greeted by coconut bra-wearing hula dancers who drape lei over your aloha-print shoulders. 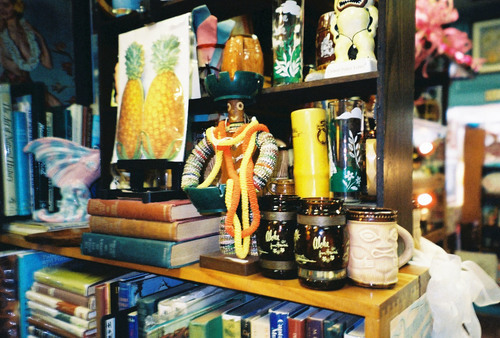 One of them hands you a mai tai in a tiki-shaped mug. In the distance, Diamond Head overlooks waves rolling onto the sand-covered doorsteps of hotels standing a few stories tall. Paradise. Step into Tin Can Mailman, and you’ll find relics of this romanticized scene. Owner Christopher Oswalt specializes in Hawaiiana antiques, specifically those from mid-century. The shop has things you find in thrift shops, like vintage aloha shirts; in rare bookstores, like a Chinese language history of Hawai‘i; and in 1950s trashcans, like bottle caps, fruit can labels, newspaper advertisements. “I deal specifically in paper and ephemera—things that aren’t meant to be saved,” Oswalt says, a map in hand. “We are the best store on the island for that.” The map Oswalt gingerly holds is a colorful depiction of the Hawaiian Islands, with icons painted in to represent landmarks that tourists visiting several decades ago would have been interested in. If you look closely, you can see a miniature city painted on the map: Honolulu. Inside this city lies Chinatown, the location of the shop.